I had the pleasure of guiding Don and Dave on Monday. 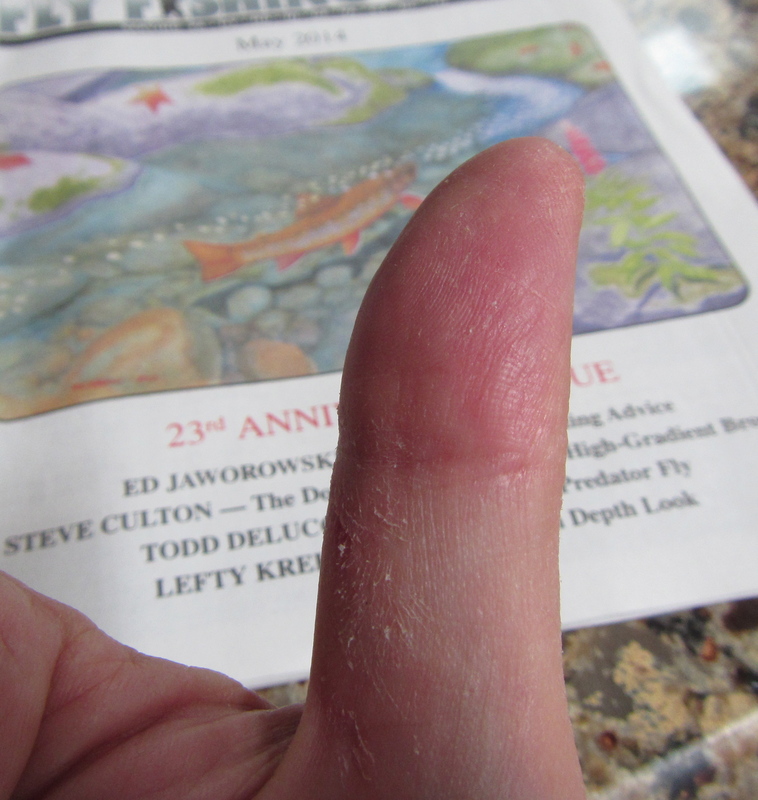 Like a lot of people I take out, they were interested in my Wet Flies 101 course. 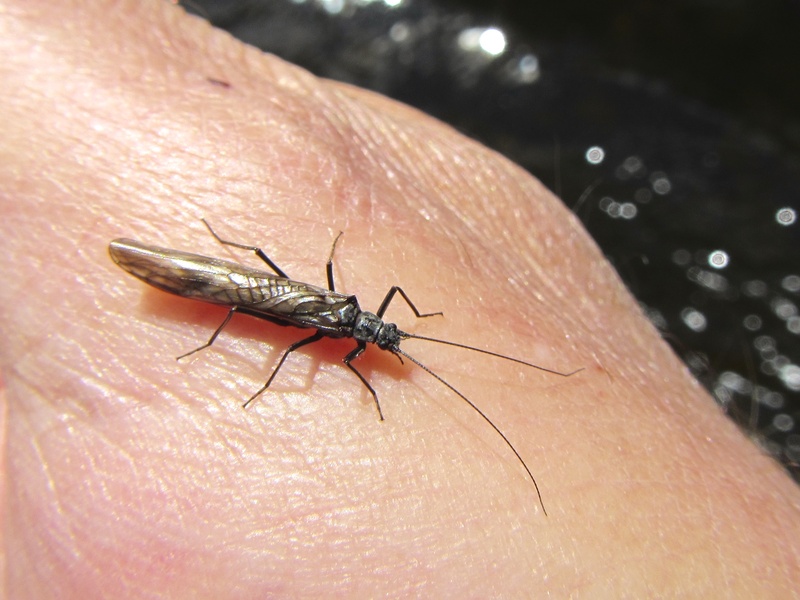 As with last Friday, the day claimed two-out-of-three positive ingredients: lovely weather (blazing, brilliant sunshine), significant hatch activity (caddis, midges, stones, mayflies) — but sadly, not much going on feeding-wise. The guys made the best of it with good spirits and an enthusiasm for learning. Don focused mainly on near-surface presentations like the mended swing, and Dave plumbed the depths with short-line dead drifts. Both methods were right today, as both caught trout. Well done, gentlemen. You are both well on your way to having some terrific days. Water temperature was 44 degrees in the upper TMA. That’s cold for this late in April. We had to get out and warm up every so often. Man working: Don making some upstream mends, watching his drift like a hawk. Rats! I forgot to get a picture of Dave. My bad. They’ll stone you when you’re trying to be so good. After we wrapped up, I ventured downstream to see if the H-word was out. Yes, in decent numbers. But due to high, cold water, predators were few and far between. 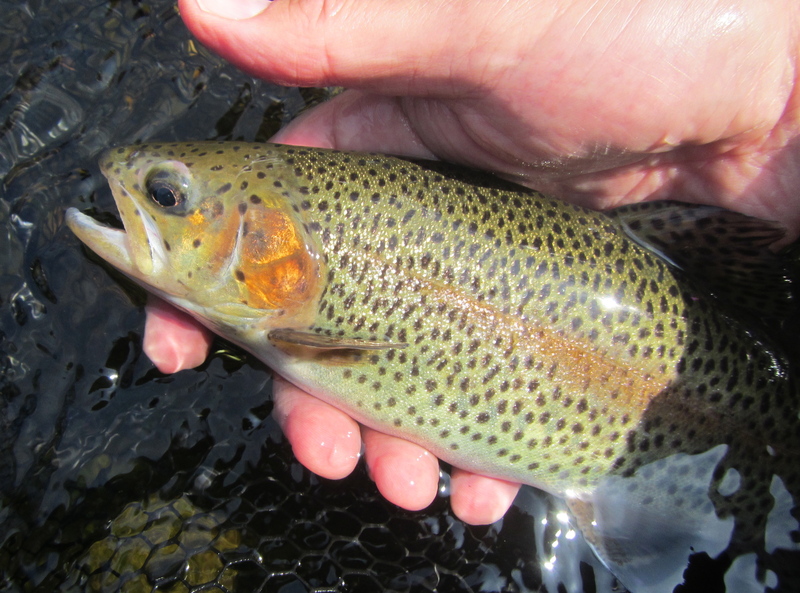 Still managed my first trout of the year on Hendrickson wet, dapping it over a feeding fish. Ker-pow! Hello, my three-tailed friend. I missed you. Kicked off my 2014 guiding season yesterday with Matt. 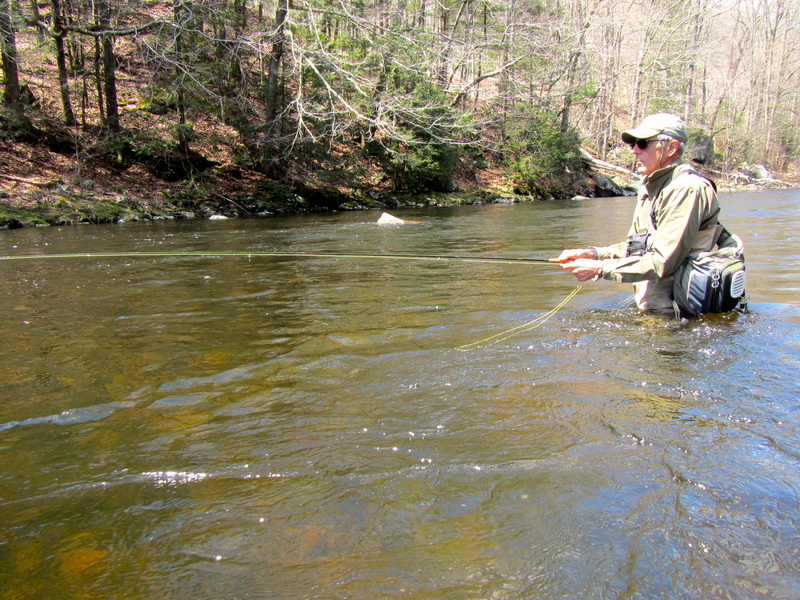 Matt wanted to take my Wet Flies 101 half-day course, and we headed to the upper TMA in search of feeding fish. 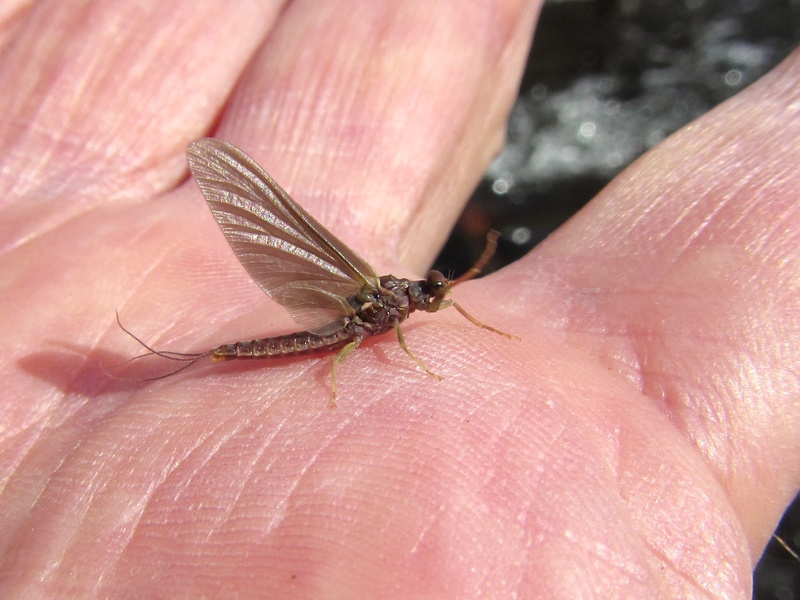 Two-thirds of nature cooperated; an absolutely glorious late April sunshine, and a snow flurries-like caddis hatch (with a few Quill-something mayflies and mounds of midges for good measure). Unfortunately, the third that really counts was in absentia. Not a damn riser anywhere. Nothing for the nymphers, and even the spin guy only managed one on his Rooster Tail. 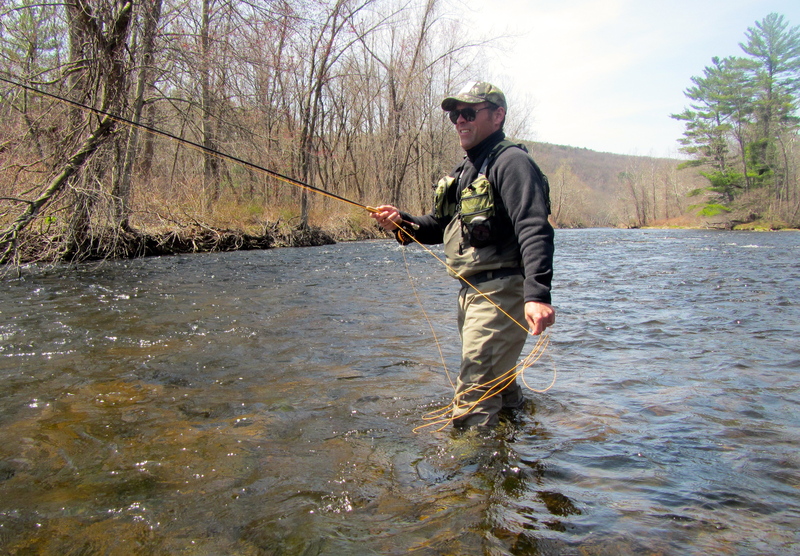 Off to below the upper TMA, where Matt rousted up a nice brown on a bead head soft-hackle Pheasant Tail. Speaking of Matt, it was gratifying to see how much he improved over the course of just a few hours. So often, you get out of something only what you put in, and he worked hard on his mending and wet fly presentations. By the end of the day, quality drifts were the rule rather than the exception. Well done, Matt! Matt executing a mended swing, focused, intent, and best of all having fun. After our session ended, we headed downstream where we found some fish willing to jump on. I also saw the first Hendricksons of the year, although two doesn’t make me do handsprings — and there was nothing rising to them. Not to be a wet blanket, but my enthusiasm is also tempered by the fact that we’re in for some cold, wet weather over the next few days. But come, they will. 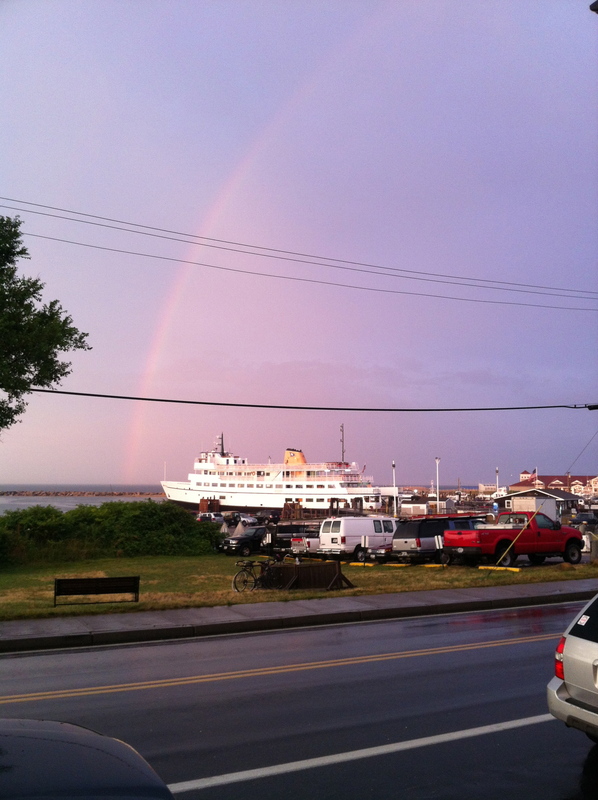 An intriguingly marked rainbow that took my BHSHPT. Love the colors on the gill plate. Landed a nice wild brown as well, and LDRed a third. A fun way to end the day. Last night I concluded a busy winter and spring presentation schedule with “Wet Flies 101” at the CT/RI Coastal Fly Fishers. Nice people and — bonus! — pizza are the friends of any speaker. Thanks for helping me set up, thanks for the spirited Q&A, and thanks to the gentleman (a thousands apologies, I forgot your name) who gave me the articulated streamer. Hope to see you again soon. A RI coastal scene from a couple summers back, taken a few hours before fly fishing commenced. How are you? That was some wind last night. Cold, too, huh? The water was warmer than the air. Technology is so cool these days, isn’t it? Cars, computers, phones…even headlamps. I remember the first one I bought for fishing. It was little more than a stubby flashlight attached to an elastic headband. 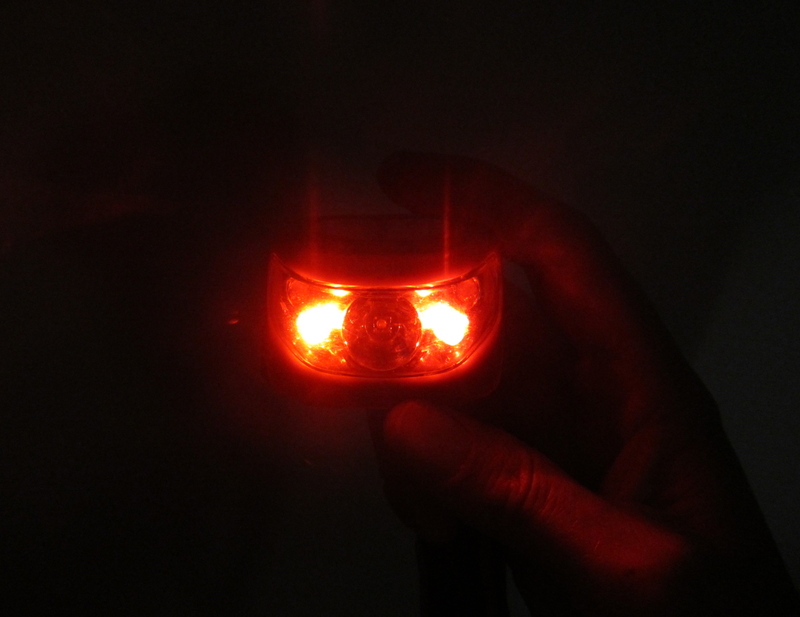 Now, you get multiple LEDs with spotlights capable of throwing 45 lumens. Or more. You can see everywhere with those things. But you already know that. You and your buddies sure got your money’s worth out of your headlamps last night. What’s on the shore? Let’s light it up! Gotta check my rig, or look at my reel? Light it up! Anything in the water in front of me? Turn on the high beams! Is that guy still fishing above us? Scotty, full power searchlights on him! Here’s the thing: that guy was me. When I’m fishing on the dark of the moon, I want my eyes, which aren’t great in the first place, to adjust to what little ambient light is available. 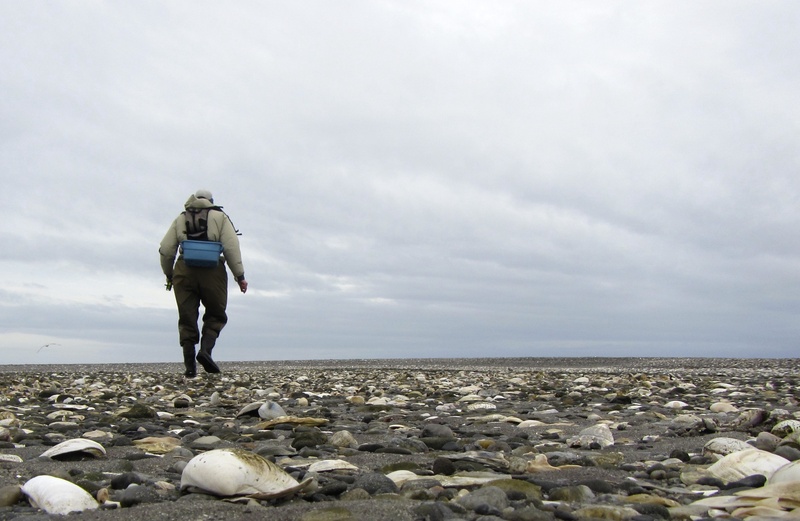 It’s tough enough wading around in the dark without stumbling over submerged rocks and gravel bars. Your 600 candlepower light bombs in my face aren’t making the job any easier. It’s also rude as hell. What’s more, flashing bright lights in the water in the pitch black of night generally isn’t good for business. Scaring the fish and all that. Which is why I cannot put into words the extent of my delight when you and your Vegas light show packed up and left. Once you were gone, a funny thing happened. I started to catch stripers. Sure, it could have been a matter of time and tide. Personally, I think it was not having your group trying to replicate the total aggregate wattage of Times Square. The bass came in nice and close, and took my Crazy Menhaden flatwing on the greased line swing with confidence. Anyway, I just wanted to say thanks for leaving. Red lights at night, gentlemen. Red lights at night. *With apologies to Billy Lagakis, from whom I so shamelessly stole this wonderful descriptor. Drew from the new spot well last night. Every day is different, so they say, and last night we had consistent action for the first hour of the mid-tide drop. Then came a lull. In hopes of attracting something bigger, I fished an 8″ flatwing/soft-hackle, a September Night variant. While it did keep the dinks away, all I could manage were cookie-cutters in the 18-24″ range. The fish-on-the-reel eludes me. The takes were similar to yesterday’s, a sensation of building pressure on the greased line swing or the dangle. A thrusting hook set, and you’re on. Bob wanted to stick the tide out a little more, but I had wanderlust. We both made the wrong call. Bob had a couple more nondescript fish, and I drew a blank. Stayed out much later than I wanted to, especially with no action, and finally dragged into bed at 3:30am. But, she’s coming. I can feel it. After a slow start, the bassing has picked up. 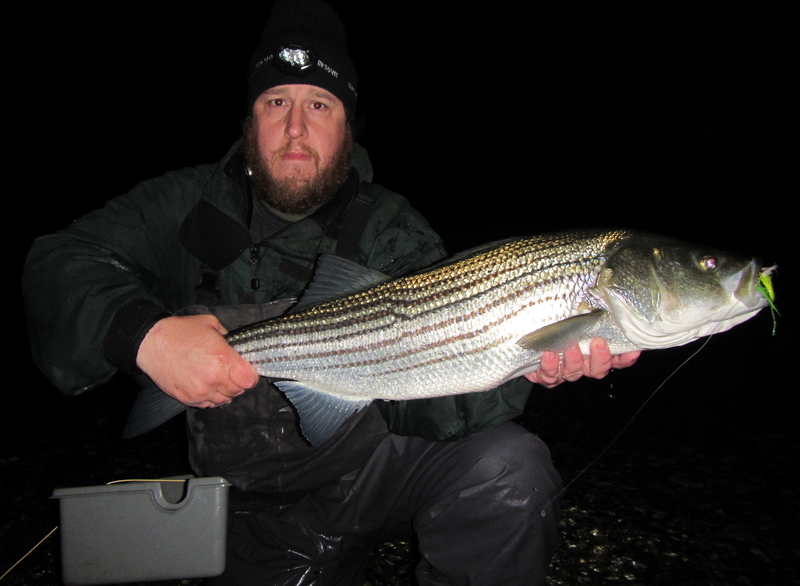 So far, I’d give this spring one striper thumbs up.